Chic Scott was born in Calgary in 1945 and is a fourth generation Albertan and a third generation Calgarian. The Scott family has been very active organizing amateur sport over the years. Charles F. Scott (ChicÍs father) was Calgary Sportsman of the Year in 1971 and was elected to the Alberta Sports Hall of Fame in 1974. Chic was very active as a golfer in his youth and represented Alberta at the Canadian Junior Golf Championship in 1961. However, in 1962 he took up mountain climbing and skiing and these two passions have dominated his life ever since. He was part of the first wave of homegrown Canadian climbers who were to earn their place in this British and European dominated sport. When it comes to the mountains, Calgarian Chic Scott is a generalist. He has contributed as a climber, ski mountaineer, and guide. He has organized clubs, organizied events and written books on the mountains. Chic was the first Canadian to break into the international climbing scene, when for five seasons during the 1960's and 1970's he climbed and guided in the European Alps in the employ of Dougal Haston. During this period he climbed the north faces of the Aiguille du Dru, Dent d'Herens, Les Courtes, the Aiguille d'Argentiere, and the Aiguille de Triolet. 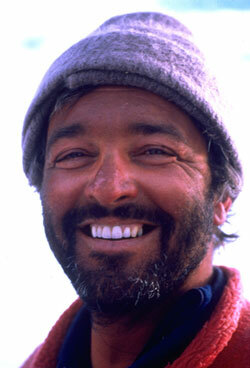 In 1973 he was one of the first Canadians to climb in the Himalaya as a member of a British Expedition to Dhaulagiri IV. Some of his more notable Canadian achievements include first ascents of Ship's Prow, near Canmore and the north buttress of Mount Stephen above Field; the first winter ascents of Mount Hungabee (1966), Mount Assiniboine (1967), and Mount Stephen (1971); major ski traverses in the Rockies and Columbia Mountains including the Jasper to Lake Louise ski traverse (1967); the east ridge of Mount Logan (1978) and a new route on the south face of McArthur Peak (1988). As a guide, Chic led ascents of the Matterhorn and th Brenva Face of Mont Blanc in the 1970's; the Rogers Pass to Bugaboos ski traverse in 1989, and in 1991 led a 71 year old man to the West Peak of Mount Logan. Chic founded the Canadian Himalayan Foundation in 1977, served a president of the Calgary Mountain Club (1985-1987), organized The Calgary Climbers Festival in 1988 and founded the prestigious John Lauchlan Award in 1995. Chic's original idea to hold a Banff Mountain Film Fesival has grown into the largest event of its kind in the world. "It's not just the beautiful mountains and the great adventures that I love; it's also the mountaineering community, the history, the art, the clubs, and the people. The whole mountain culture is important to me and I suppose it is my calling in life." In 1995 Chic was elected an honourary member of the Association of Canadian Mountain Guides, in 1997 an honourary member of the Calgary Mountain Club, and in 2000 and honourary member of the Alpine Club of Canada. In 2000 he received the Banff Mountain Film Festival Summit of Excellence Award for a life-time's contribution to the mountains. As a writer he has produced, "The History of the Calgary Mountain Club" (1987), "Alpinism" (1988), "Ski Trails in the Canadian Rockies" (1992), "Summits and Icefields" (1994), co-authored "The Yam" (2003), and "Powder Pioneers" (2005). His greatest writing effort was the highly acclaimed, "Pushing the Limits -The Story of Canadian Mountaineering" (2000).